Le Club AccorHotels has launched a new promotion for stays in Germany & Austria between November 1 – December 31, 2016, that are booked October 25 – December 31. Members can earn 300 bonus points on their first stay and 500 on all subsequent ones. Platinum members are eligible for additional bonus of 200 points (per stay?). Note that you must register for this offer and book during the valid booking dates. Some bonus points for those staying in Germany and Austria before the end of the year. You have to keep in mind that all the points earned will count towards the status until the end of this year including those from bonuses. 1. General Le Club AccorHotels terms and conditions apply to the Annual final-sprint 2016offer and you must be Le Club AccorHotels member to benefit from it. 2. This offer entitles Le Club AccorHotels members, regardless of their status, to benefit from earning 300 bonus points for the first stay and 500 bonus points for all following stays in one of the participating hotels in Le Club AccorHotels Loyalty program. 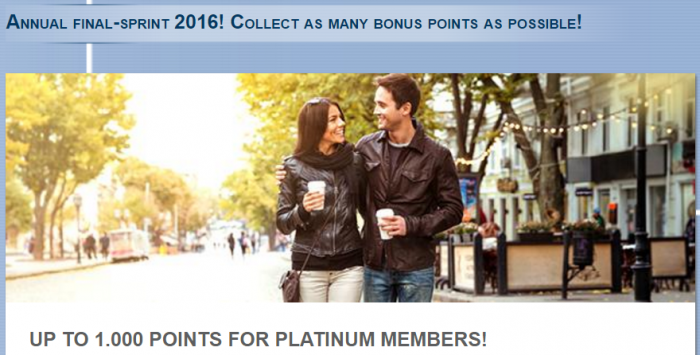 Platinum members earn an additional bonus of 200 points. 3. This offer is valid for a member’s stay from 01/11/2016 to 31/12/2016 in one of the participating hotels in Germany and Austria, and booked between 25/10/2016 and 31/12/2016. 5. Any consecutive stays (check-out and check-in same day) in the same hotel, will be considered as a single stay. This single stay will be eligible once to the Annual final-sprint 2016 offer. 13. Please specify the reference 47942 in all your communications with AccorHotels call centers or customers care services related to this offer. You must register for the Annual final-sprint 2016offer before proceeding to the booking, to be eligible to the offer. Next articleHyatt Further Cheapens The Brand: Now With Offshore Call Centers In The Philippines!